The American border patrol regime was lethally effective long before Donald Trump came along. At the federal courthouse, Ignacio Sarabia asks the magistrate judge, Jacqueline Rateau, if he can explain why he crossed the international boundary between the two countries without authorization. He has already pleaded guilty to the federal misdemeanor commonly known as “illegal entry” and is about to receive a prison sentence. On either side of him are eight men in the same predicament, all still sunburned, all in the same ripped, soiled clothes they were wearing when arrested in the Arizona desert by agents of the US Border Patrol. Once again, the zero tolerance border enforcement program known as Operation Streamline has unfolded just as it always does here in Tucson, Arizona. Close to sixty people have already approached the judge in groups of seven or eight, their heads bowed submissively, their bodies weighed down by shackles and chains around wrists, waists, and ankles. The judge has handed out the requisite prison sentences in quick succession — 180 days, 60 days, 90 days, 30 days. On and on it goes, day in, day out. Like so many meals served in fast-food restaurants, 750,000 prison sentences of this sort have been handed down since Operation Streamline was launched in 2005. This mass prosecution of undocumented border-crossers has become so much the norm that one report concluded it is now a “driving force in mass incarceration” in the United States. Yet it is only a single program among many overseen by the massive US border enforcement and incarceration regime that has developed during the last two decades, particularly after September 11. Sarabia takes a half-step forward. “My infant is four months old,” he tells the judge in Spanish. The baby was, he assures her, born with a heart condition and is a US citizen. They have no option but to operate. This is the reason, he says, that “I’m here before you.” He pauses. Earlier in April 2016, Republican presidential candidate Donald Trump, still in the heat of his primary campaign, stated once again that he would build a massive concrete border wall towering thirty (or, depending on the moment, fifty-five) feet high along the two-thousand-mile US-Mexican border. He would, he insisted, force Mexico to pay for the $8 billion to $10 billion barrier. Repeatedly throwing such red meat into the gaping jaws of nativism, he has over these last months also announced that he would create a major “deportation force,” repeatedly sworn that he would ban Muslims from entering the country (a position that he regularly revises), and most recently, that he would institute an “extreme vetting” process for foreign nationals arriving in the United States. As he pulled that promise out of a hat, the actual history of the border disappeared. From then on in election 2016, there was just empty desert and Donald Trump. Suddenly, there hadn’t been a bipartisan government effort over the last quarter century to put in place an unprecedented array of walls, detection systems, and guards for that southern border. In those years, the number of Border Patrol agents had, in fact, quintupled from four thousand to more than twenty-one thousand, while Customs and Border Protection became the largest federal law enforcement agency in the country with more than sixty thousand agents. The annual budget for border and immigration enforcement went from $1.5 to $19.5 billion, a more than twelve-fold increase. By 2016, federal government funding of border and immigration enforcement added up to $5 billion more than that for all other federal law enforcement agencies combined. Operation Streamline, a cornerstone program in the “Consequence Delivery System,” part of a broader Border Patrol deterrence strategy for stopping undocumented immigration, is just one part of a vast enforcement-incarceration-deportation machine. The program is as no-nonsense as its name suggests. It’s not The Wall, but it embodies the logic of the wall: either you crossed “illegally” or you didn’t. It doesn’t matter why, or whether you lost your job, or if you’ve had to skip meals to feed your kids. It doesn’t matter if your house was flooded or the drought dried up your fields. It doesn’t matter if you’re running for your life from drug cartel gunmen or the very army and police forces that are supposed to protect you. It’s important to understand Sarabia’s journey, and that of so many thousands like him who end up in this federal courthouse day after day. As he pleads to be with his newborn son, his voice cracking with emotion, his story catches the already Trumpian-style of border enforcement — both the pain and suffering it has caused, and the strategy and massive buildup behind it — in ways that the campaign rhetoric of both parties and the reporting on it doesn’t. As reporters chase their tails attempting to explain Trump’s wild and often unfounded claims and declarations, the on-the-ground border reality goes unreported. Indeed, one of the greatest “secrets” of the 2016 election campaign (though it should be common knowledge) is that the border wall already exists. It has for years, and the fingerprints all over it aren’t Donald Trump’s but the Clintons’, both Bill’s and Hillary’s. Twenty-one years before Trump’s wall-building promise (and seven years before the 9/11 attacks), the US Army Corps of Engineers began to replace the chain-link fence that separated Nogales, Sonora, in Mexico from Nogales, Arizona, in the United States with a wall built of rusty landing mats from the Vietnam and Persian Gulf wars. Although there had been various halfhearted attempts at building border walls throughout the twentieth century, this was the first true effort to build a barrier of what might now be called Trumpian magnitude. In 1994, the threat wasn’t “terrorism.” In part, the call for more hardened, militarized borders came in response, among other things, to a never-ending drug war. It also came from US officials who anticipated the displacement of millions of Mexicans after the implementation of the new North American Free Trade Agreement (NAFTA), which, ironically, was aimed at eliminating barriers to trade and investment across North America. And the expectations of those officials proved well justified. The ensuing upheavals in Mexico, as analyst Marco Antonio Velázquez Navarrete explained to me, were like the aftermath of a war or natural disaster. Small farmers couldn’t compete against highly subsidized US agribusiness giants like Cargill and Archer Daniels Midland. Mexican small business owners were bankrupted by the likes of Walmart, Sam’s Club, and other corporate powers. Mining by foreign companies extended across vast swaths of Mexico, causing territorial conflicts and poisoning the land. The unprecedented and desperate migration that followed came up against what might be considered the other side of the Clinton doctrine of open trade: walls, increased border agents, increased patrolling, and new surveillance technologies meant to cut off traditional crossing spots in urban areas like El Paso, San Diego, Brownsville, and Nogales. Over the next twenty years, that border apparatus would expand exponentially in terms of personnel, resources, and geographic reach, but the central strategy of the 1990s (labeled “Prevention Through Deterrence”) remained the same. The ever-increasing border policing and militarization funneled desperate migrants into remote locations like the Arizona desert where temperatures can soar to 120 degrees in the summer heat. The first US border strategy memorandum in 1994 predicted the tragic future we now have. “Illegal entrants crossing through remote, uninhabited expanses of land and sea along the border can find themselves in mortal danger,” it stated. Twenty years later, more than six thousand remains have been found in the desert borderlands of the United States. Hundreds of families continue to search for disappeared loved ones. The Colibri Center for Human Rights has records for more than 2,500 missing people last seen crossing the US-Mexico border. That border has become a graveyard of bones and sadness. Despite all the attention given to the wall and the border this election season, neither the Trump nor Clinton campaigns have mentioned “Prevention Through Deterrence,” nor the subsequent border deaths. The same goes for the establishment media that can’t stop talking about Trump’s wall. There has been little or no mention of what border groups have long called a “humanitarian crisis” of deaths that have increased five-fold over the last decade, thanks, in part, to a wall that already exists. Although wall construction began during Bill Clinton’s administration, the Department of Homeland Security (DHS) built most of the approximately seven hundred miles of fencing after the Secure Fence Act of 2006 was passed. At the time, Senator Hillary Clinton voted in favor of that Republican-introduced bill, along with twenty-six other Democrats. The 2006 wall-building project was expected to be so environmentally destructive that homeland security chief Michael Chertoff waived thirty-seven environmental and cultural laws in the name of national security. In this way, he allowed Border Patrol bulldozers to desecrate protected wilderness and sacred land. With a price tag of, on average, $4 million a mile, these border walls, barriers, and fences have proven to be one of the costliest border infrastructure projects undertaken by the United States. For private border contractors, on the other hand, it’s the gift that just keeps on giving. In 2011, for example, the DHS granted Kellogg, Brown, and Root, a subsidiary of Halliburton, one of our “warrior corporations,” a $24.4 million upkeep contract. In Tucson in early August, Republican vice presidential candidate Mike Pence looked out over a sea of red “Make America Great Again” caps and t-shirts and said, “We will secure our border. Donald Trump will build that wall.” He would be met with roaring applause, even though his statement made no sense. Should Trump actually win, how could he build something that already exists? Indeed, for all practical purposes, the “Great Wall” that Trump talks about may, by January 2017, be as antiquated as the Great Wall of China given the new high-tech surveillance methods now coming on the market. These are being developed by a booming border techno-surveillance industry. Hillary Clinton’s promise of “comprehensive immigration reform” — to be introduced within one hundred days of her entering the Oval Office — is a much more reliable guide than Trump’s wall to our grim immigration future. If her bill follows the pattern of previous ones, as it surely will, an increasingly weaponized, privatized, high-tech, layered border regime, increasingly dangerous to future Ignacio Sarabias, will continue to be a priority of the federal government. On the surface, there are important differences between Clinton’s and Trump’s immigration platforms. Trump’s wildly xenophobic comments and declarations are well-known, and Clinton claims that she will, among other things, fight for family unity for those forcibly separated by deportation and enact “humane” immigration enforcement. Yet the policies of the two candidates are far more similar than they might at first appear. That April day, only one bit of information about Ignacio Sarabia’s border crossing to reunite with his wife and newborn child was available at the Tucson federal courthouse: he had entered the United States “near Nogales.” Most likely, he circumvented the wall first started during the Clinton administration, like most immigrants do, by making his way through the potentially treacherous canyons that surround that border town. If his experience was typical, he probably didn’t have enough water or food, and suffered some physical woe like large, painful blisters on his feet. Certainly, he wasn’t atypical in trying to reunite with loved ones. After all, more than 2.5 million people have been expelled from the country by the Obama administration, an average annual deportation rate of close to 400,000 people. This was only possible thanks to laws signed by Bill Clinton in 1996 and meant to burnish his legacy. They vastly expanded the government’s deportation powers. In 2013 alone, Immigration and Customs Enforcement carried out seventy-two thousand deportations of parents who said that their children were US-born. And many of them are likely to try to cross that dangerous southern border again to reunite with their families. The enforcement landscape Sarabia faced has changed drastically since that first wall was built in 1994. 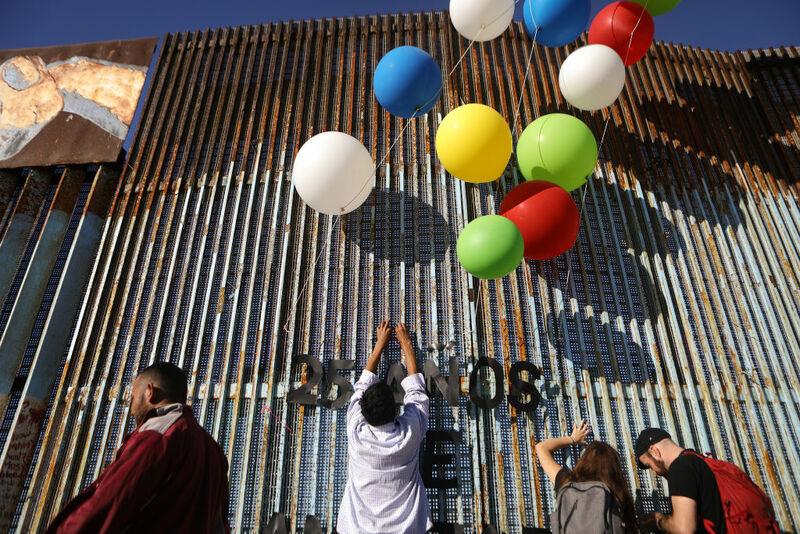 The post-9/11 border is now both a war zone and a showcase for corporate surveillance. It represents, according to Border Patrol agent Felix Chavez, an “unprecedented deployment of resources,” any of which could have led to Sarabia’s capture. It could have been one of the hundreds of remote video or mobile surveillance systems, or one of the more than twelve thousand implanted motion sensors that set off alarms in hidden operational control rooms where agents stare into large monitors. It could have been the spy towers made by the Israeli company Elbit Systems that spotted him, or Predator B drones built by General Atomics, or VADER radar systems manufactured by the defense giant Northrup Grumman that, like so many similar technologies, have been transported from the battlefields of Afghanistan or Iraq to the US border. If the comprehensive immigration reform that Hillary Clinton pledges to introduce as president is based on the already existing bipartisan Senate package, as has been indicated, then this corporate-enforcement landscape will be significantly bolstered and reinforced. There will be nineteen thousand more Border Patrol agents in roving patrols throughout “border enforcement jurisdictions” that extend up to a hundred miles inland. More F-150 trucks and all-terrain vehicles will rumble through and, at times, tear up the desert. There will be more Blackhawk helicopters, flying low, their propellers dusting groups of scattering migrants — many of them already lost in the vast, parched desert. If such a package passes the next Congress, up to $46 billion could be slated to go into more of all of this, including funding for hundreds of miles of new walls. Corporate vendors are salivating at the thought of such a future and in a visible state of elation at homeland security trade shows across the globe. I’m mesmerized by his story as I sit on a wooden bench at the back of the court. I have a child the same age as his son. I can’t imagine his predicament. Not once while he talks does it leave my mind that my child might even have the same birthday as his. The judge then looks directly at Sarabia and tells him that he can’t just come here “illegally,” that he has to find a “legal way” (highly unlikely, given the criminal conviction that will now be on his record). She then sentences the nine men standing side by side in front of her for periods ranging from 60 days to 180 days for the crime of crossing an international border without proper documents. Sarabia receives a sixty-day sentence. Next, armed guards from G4S — the private contractor that once employed Omar Mateen (the Pulse nightclub killer) and has a lucrative quarter-billion-dollar border contract with Customs and Border Protection — will transport each of the shackled prisoners to a Corrections Corporation of America private prison in Florence, Arizona. There, Sarabia will think about his child’s endangered heart from behind layers of coiled razor wire, while the corporation that runs the prison makes $124 per day for incarcerating him. Todd Miller is a regular contributor to TomDispatch and the author of Border Patrol Nation: Dispatches From the Front Lines .